This guide is for the Nintendo DS version. 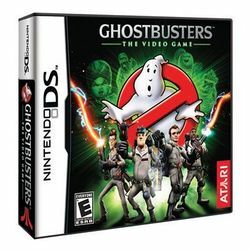 For the PC, Xbox 360, and PlayStation 3 version and the PlayStation 2, PSP and Wii version, see Ghostbusters: The Video Game and Ghostbusters: The Video Game (Nintendo Wii). Ghostbusters: The Video Game is one of three games with the same title. The Nintendo DS version, developed by Zen Studios and published by Atari, was released on June 16, 2009. The game features action elements and resource management strategy. Players get to drive the Ghostbusters' vehicle, the Ecto-1. This page was last edited on 18 July 2016, at 16:05.